The American Psychological Association (APA) has established a style that it uses in all of the books and journals that it publishes. Many others working in the social and behavioral sciences have adopted this style as their standard as well. Citation styles change over time. Be sure to only use the most recent resources that reflect the current edition. 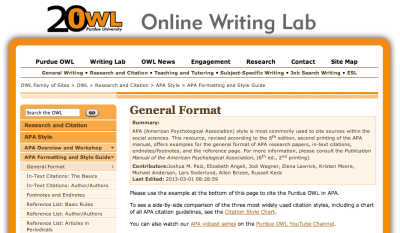 Online APA reference- with instructions & examples for most citation types. OWL also has a collection of APA formatting video tutorials on YouTube. If the manual does not answer your questions consider using the blog's Contact Us page. You can even follow them on Twitter or Facebook. Watch the Basics of APA Style tutorial. From OWL - the Purdue (University) Online Writing Lab. Here is a sample paper provided by APA. For every style rule, there is a comment highlighted in the paper that tells you where to find the discussion of the rule in the APA Style Manual. Below is a reminder of some common formatting details that sometimes are overlooked. Line Spacing: double-space the reference list. Hanging indent: indent all but the first line of each entry (the opposite of how you indent a paragraph). Italicization: book titles, journal titles and volume number are italicized; do not italicize article titles. DOI: for electronic materials, if you have a doi#, you do not need to include the URL. Capitalization: for book or article titles, only capitalize the first word of the title and subtitle. Also capitalize proper nouns.